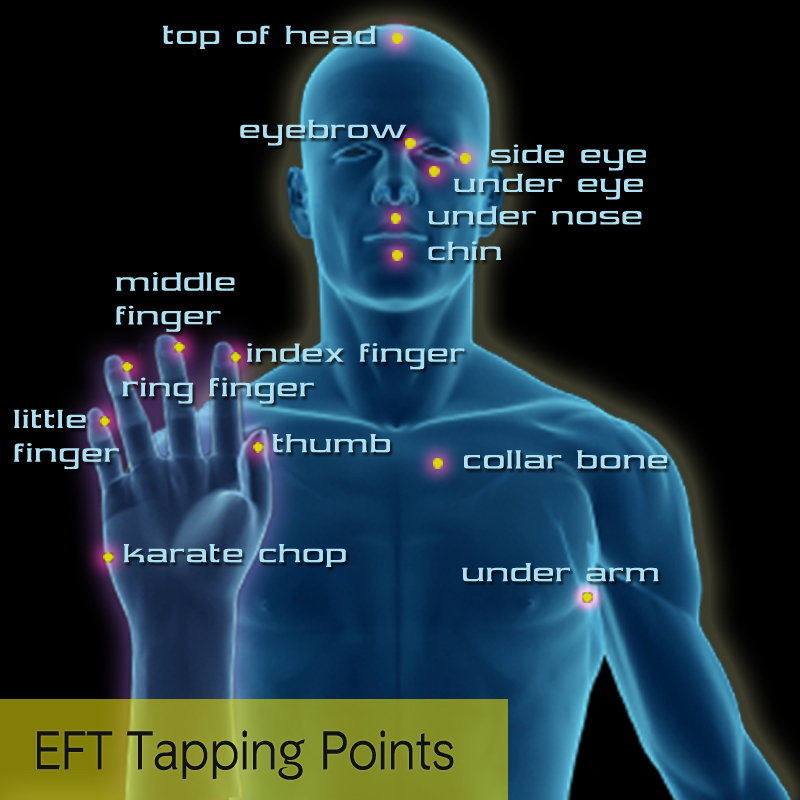 EFT is a method that combines talking about a problem and tapping on meridian points to bring about different, more comfortable feelings about it. An emotional, needle-free version of acupuncture, EFT requires the user to tap on certain meridian points with the fingertips. Since emotional stress can contribute to discomfort, EFT often provides astonishing relief. Think about the feeling that is troubling you and rate its intensity on a scale of 1 to 10. Begin tapping on the KC point (see hand drawing) saying a set-up phrase. For example: “Even though I feel so stressed out, I’m still a good person.” Say this three times. When you have finished tapping each point while saying the reminder phrase, return to tapping on the KC and ask yourself how intense the feeling is now on a scale of 1 to 10. Continue tapping in this manner until you feel better. While you tap, pay attention to thoughts and feelings that arise and change your tapping phrase to include them. That’s it. This Super-Easy Tapping Guide will get you started. Using these techniques, you should be able to tap your way to feeling better in stressful situations or to eliminate minor aches and pains. The easy steps are great for showing children how to manage their own emotions. I also encourage you to read my article about how one session with an EFT professional changed my life. Experiencing Matrix Reimprinting brings about even more profound changes. Such a fan of EFT. Just tapped with a friend of mine. Feeling much lighter. Yes, it’s a bunch of hooey, but it works.